Nungnung is the name of a small village, 40 kilometers north of Denpasar with a height of 900 meters above sea level. This tourism object is located in Badung District evening. It lies about – about five miles before the bridge Tukad Bangkung known as the tallest bridge in Asia with a specific height of the pillars reached 71.14 meters. in this village there is a waterfall with a height of 50 meters with large water discharge. to reach the location of such waterfalls we must trace hilly rice fields about 2 miles from the highway. Nungnung waterfall is one of the Bali nature heritages with fresh atmosphere greeting all visitors who visit this site. The tiredness will be paid off by the peaceful ambiance and beautify of Nungnung waterfall. The fresh and clear water condition is also good for swimming or playing with water, meanwhile natural fresh water suddenly refresh your body and soul. We recommend you to bring changing clothes if you want to on water. 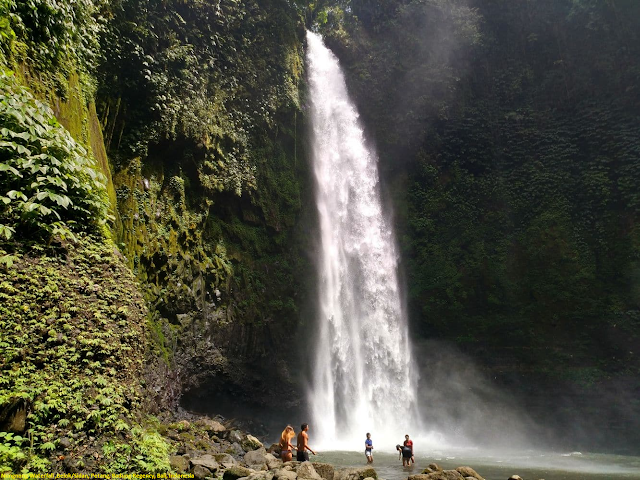 When expanding our trips at this site, you may discover Dutch colonial heritage and small temple as shrine of Vishnu God located just beside of this waterfall. The temple was build when Nungnung Waterfall opened and promoted as tourism object in 1996 by Badung Government. The Temple festival or also called by Piodalan is held in Purnama Karo (full moon), where many Hindu people come to this shrine for worshiping.